This time of year we expect colds to come fast and furious to daycares and elementary schools. 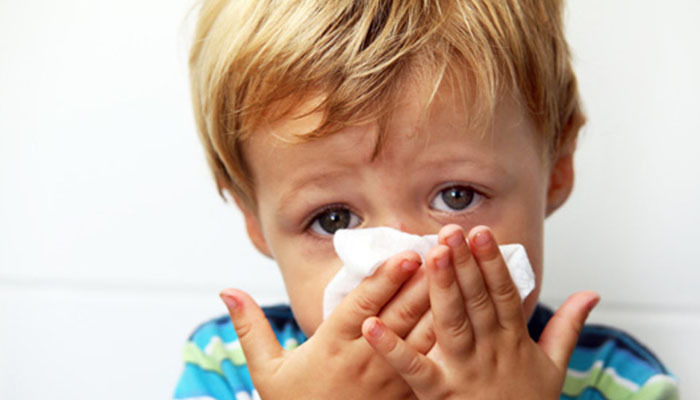 It is not at all uncommon for a child’s first winter in daycare or school to catch 10–12 colds. Each of the colds tend to last 10–14 days. That means that your child’s first winter exposed to other children may leave them with some cold symptoms for 5 or more months. If that seems like a long time, it is but most kids persevere and come out of the season OK. They may be miserable for a portion of that time, but they will be fine in the end. Fortunately most colds and even influenza are minor viral illnesses which can be managed at home. For dry stuffy noses without much discharge you can just use some saline nose drops. 3 drops to each nostril should help loosen up dry secretions. If your child is old enough to blow, then have them do so a minute after putting in the drops. If they are too young to blow, then use a soft rubber suction bulb to remove the mucous. If things are really bad at night, despite your best efforts with the saline, there are decongestant nose drops available. Please call or make an appointment to visit us to help guide you through your first use of them. If their nose is really, really runny just blowing or using the suction bulb is the best and only option. All over the counter medicine we had used in the past was studied and found to not be helpful, and perhaps even harmful, so it is no longer made for children under 4. If you think your child is having problems breathing, and the problems are not because of a stuffy nose, then they should be seen as soon as possible. Not surprisingly, breathing is very important and if they are struggling we have medicine and techniques that may be very beneficial to your child. Call us to schedule an appointment as soon as you can so we can make sure they are at optimum health. We can be reached at 952-401-8300.